We are a full service financial institution with a complete line of deposit and loan products. McHenry Savings Bank has been serving the banking needs of the residents of McHenry County since 1955. 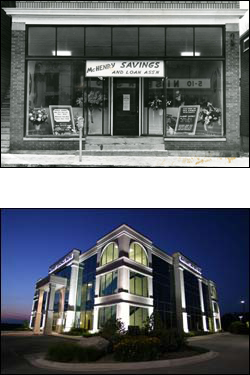 Starting in 1967 we have opened and maintained local branch locations and in 2002 we celebrated our grand opening of our McHenry Financial Building at 353 Bank Drive in McHenry, IL. We are local people making local decisions.